This photo was posted on Tumblr over the weekend. It was taken at McAdory High School in McCalla, Ala.
Last night, this sign went up at a McAdory High School football game. 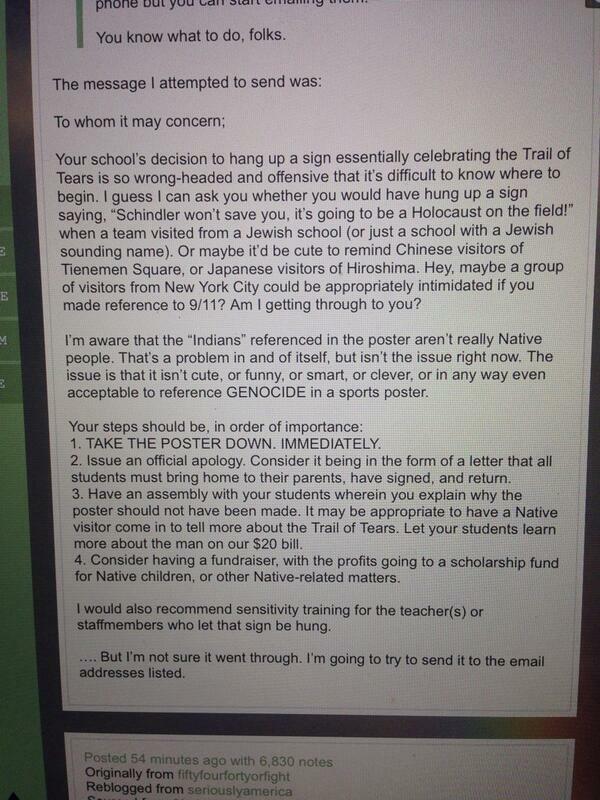 I am absolutely disgusted that this sign was allowed to go up, and that it was not stopped by school administrators, and that after this, no one has mentioned it.The school and the students have shown no remorse for the sign (as expected) and the students have claimed ignorance and/or that it was just a "joke".Sorry, but the Indian Removal Act of 1830 and the death of thousands of Native Americans is not a joke.EDIT: As of 5 pm Sunday, no response from the school has been issued, and the local news to which I have reported this incident have not looked into it either. Further information will be added as it comes to me. The banner generated outrage on Twitter, with users demanding that the school issue an apology. The sign didn&#39;t mean "trail of tears round 2" lol it was round 2 of the playoffs. The sign didn't mean "trail of tears round 2" lol it was round 2 of the playoffs. this was the email that was sent to macadory. that sign is in the trash. Monday night, McAdory High School issued an apology. On 11/15/2013 at a football game at McAdory High School, a sign was displayed that made reference to the "Trail of Tears" in which Native Americans were subjected to horrific atrocities. This was not condoned by the school administration, the Jefferson County Board of Education or the community. The person who would normally be responsible for approving such signs is out on maternity leave, and I take full responsibility that arrangements were not made to have the signs pre-approved before the ballgame. Please accept our sincere apologies to the Native American people and to anyone who was offended by the reference to an event that is a stain on our nation's past forever.In response to the "bust thru" sign used by McAdory High School during the Round 2 State Play-Off game versus Pinson Valley High School, all social studies and history teachers will re-teach and/or review units concerning Native American displacement following the Indian Removal Act of 1830.